One dead, three injured in shooting at Youtube headquarters. Trump to send military troops to Mexican border. Dutch lawyer jailed in in Trump-Russia inquiry. Source of nerve agent not found. Prince Philip admitted to a hospital. MSD gunman will face the death penalty. Charlottesville witness sues nutball Alex Jones for defamation. Another Putin critic found dead in Britain. Man caught on camera stealing peacock. British PM says Russia was behind poison attack on ex-spy. Deadly bombings in Austin linked. No word yet from North Korea on summit. Qataris clam up on Kushner’s secret meetings. New York City attack suspect charged with terrorism. Russian trolls’ social media posts shown. Britain’s defense secretary resigns after improper behavior. California hostage crisis ends with death of suspect. San Juan mayor to Trump: You can’t handle the truth. The Astros won the World Series! Eight killed in truck attack in New York City. Spain court summons fired Catalan leader. Odinga rejects “sham” Kenya election re-run. Parent barricades school, holds teacher hostage in California. Tech titans testify before Senate about Russian propaganda. Deadly bombing in downtown Damascus. U.S. warship sails close to disputed island in the South China Sea. Bronx hospital shooter sent e-mail to paper before rampage. Misbehaving child posts stupid tweet about CNN. The Tigers hit the cellar. Several lost in boat sinking off Colombia. Kasich website hacked by ISIS. Turkish police stifle gay pride parade in Istanbul. Gasoline tanker fire in Pakistan kills over 100. ISIS blows up Mosul landmark mosque. Russia hacked 21 states in 2016 election. Officer stabbed at Flint airport. No Thanks; Who wants to be the next CEO at Uber? Tropical Update: TS Cindy could cause massive flooding along the Gulf Coast. Innocent Bystanders — Leonard Pitts, Jr. in the Miami Herald. You felt it with a sickening certainty the instant news of a mass shooting flashed out from Alexandria, Virginia. So it was disheartening, but hardly surprising, to hear certain conservatives reflexively blame Democrats and their so-called “hate speech” for the carnage. It happened Wednesday morning. The quiet camaraderie of Republican lawmakers practicing for a charity baseball game against their Democratic colleagues was shattered by rifle shots from one James Hodgkinson of Belleville, Illinois. Police officers providing security returned fire. When the shooting was done, five people were wounded, including two officers and Louisiana Rep. Steve Scalise, whose injuries were critical. Hodgkinson, a 66-year-old left winger and former supporter of Bernie Sanders who was apparently motivated by hatred for Donald Trump and the GOP, was mortally wounded. At some point, you’d think we’d learn that rhetoric — excluding that which explicitly or implicitly calls for violence — does not “cause” people to shoot, stab, or bomb. By that logic, you’d have to blame Fox “News” and other organs of the right for the Planned Parenthood shooting and the Atlanta Olympics bombing. These tired games of political one-upsmanship are too small for such a moment. This moment is for soul-searching, for considering who and what and even if we are, as Americans. It is for wondering what it means when baseball is not safe and being a Republican gets you shot. Nothing less than our national identity and ideals are at stake here. A maniac shot up a ball field Wednesday morning. Five people were hit. Propaganda Pros — Terry Heaton in Huffington Post on how the Religious Right pioneered right-wing propaganda. So-called “fake news” took center stage on several occasions during former FBI Director James Comey’s testimony before the Senate Intelligence Committee last week. More than once, Comey pointed to specific articles by the New York Times as not true or completely false. However, he did validate others, including one in which he himself had been the Times’ source. The fake news meme has become one of the most troubling arguments in the history of contemporary journalism, ever since Donald Trump used the term to describe CNN at his first press conference as president. Americans find themselves drowning in this unseemly and childish battle for the soul of news and information purveyance, and the undiscussed problem is that the entire mess is built on the false narrative of “the liberal (elite) press.” I know, because I was among the people who advanced the concept and shaped the discussion in the early ‘80s, as senior and executive producer of Pat Robertson’s flagship television program The 700 Club. Before Fox News, there was The 700 Club with CBN News and “TV Journalism With A Different Spirit.” We knew what we were doing in the exploitation of the word “liberal,” and truth-telling demands its deconstruction today. The all-or-nothing split between conflicting political narratives has reached its pinnacle with the election of Donald Trump, and it needs to be hacked into a million pieces. William F. Buckley was among the first to give the word “liberal” a pejorative interpretation, but it was the wordsmith William Safire writing for Spiro Agnew who in 1969 elevated it to a political talking point in his famous speech that opened the war against the press during Richard Nixon’s secret battles in Vietnam. The word became the central weapon in a strategy that involved attacking the messenger instead of changing the message. That political strategy has been so effective to date that it has given birth to the idea that mainstream news is actually “fake news” and not to be believed in the administration of President Donald Trump. The number of people who now believe this falsehood is staggering, and it poses a real threat to our democracy. So let’s look at these events closely, because it has a direct bearing on the conflict today. Let me be very clear: the right-wing “news” that we created was a political response to the progressive nature of news and information. It’s important to understand this, because “right-wing news” is oxymoronic. There is no such thing, because the right represents olds, not news. By definition, news is new, and new is progressive. That conservatives view this as a bias is fine, but elevating that to some evil command-and-control mechanism for political liberals is a false narrative. Rush Limbaugh has made a living off of this phony hegemony, as well as Sean Hannity, Tucker Carlson, and whole host of mostly broadcasting personalities. Why? Because it sells and has been selling for almost 50 years. But it’s entirely false, for the press is not the purveyor of fake news. That title belongs with those who create stories for political gain and clickthroughs. It may be politically expedient to label the mainstream as fake, but in order to do so, one’s source must be propaganda and nothing else. To us in the early ‘80s, it was easy to stake our claim in the world of journalism without complaint, because the press thought us outside Hallin’s Sphere of Legitimate Controversy and therefore unnecessary to cover. 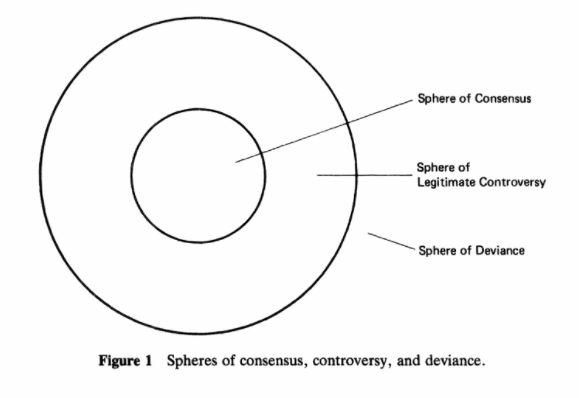 In his 1986 book The Uncensored War, Daniel C. Hallin identified three spheres of coverage by the Washington press corps. Ron Powers once said of us on CBS Sunday Morning that we were “so slanted as to be vertical,” but for the most part, we operated without notice, which gave us the time to write our playbook, the one borrowed in order to create Fox News. The editorial commentators of media companies determine their political leanings, not the content of the news itself. To behave otherwise is a violation of journalistic ethics and tenets, and no self-respecting news outlet would deliberately compromise its relationship with viewers or readers for political gain. It’s just not their cultural role. Only political propagandists are permitted such luxury, and where that is disguised as news, it cannot be trusted. And yet many people do, because their ears have been trained by people such as myself to identify clever social engineering as information they need in order to get back what they feel has been taken from them or get what feel they deserve from life. We need to grow out of childish ranting that “Billy started it” or “everybody is doing it too” and let our inner adults take over. Democracy doesn’t stand a chance without an independent Fourth Estate. Class Act — Ben Brantley in the New York Times with an appreciation of playwright A.R. Gurney. There have been many tributes to A. R. Gurney, a prolific playwright whose worldly elegance of style was matched by his ingenuous enthusiasm for his craft. But Mr. Gurney, who died on Tuesday at 86, wrote what was surely the most exultant of these eulogies himself, in a play performed in New York more than 10 years ago. But a graduate student and his professor at a “faith based” American university unearth a manuscript of an incendiary play that they are determined to bring to light. And though the all-seeing eyes of the surveillance state discover the work’s existence and have it destroyed, our determined academic heroes recreate it from memory. And what a profoundly influential play it turns out to be, as its performances spark rebellion against reactionary governments throughout the world. Its title? Also “Post Mortem.” Its author? One A.R. Gurney, described dismissively as a “minor late-20th-, early-21st-century” writer of the “middle-class comedy of manners,” who it now emerges had not only secretly written an earthshaking drama but also had affairs with Cameron Diaz and both Audrey and Katharine Hepburn. A playwright can dream, can’t he? Like most of his work — which includes classic anatomies of a vanishing patrician species of pale skin and inhibiting politeness (“The Dining Room,” “The Cocktail Hour,” “The Perfect Party”), “Post Mortem” is steeped in a sardonic wistfulness. It was written as a futurist comedy that exaggerated its author’s hopes and fears for a world to come that in many ways already existed. Mr. Gurney’s writing never brought him the fame and wealth of contemporaries like Edward Albee and Neil Simon. His only plays seen on Broadway in recent years were short-lived revivals of his charming “Sylvia” (1995), about a divisive family dog, and the lyrical two-hander “Love Letters” (1989), an epistolary work that charts the course of a relationship over many decades. Yet Mr. Gurney adored the theater with a passion that spilled over the edges of even his most decorous comedies, and he feared for its survival. He was his generation’s greatest practitioner of that gentle paradox, the elegiac comedy, which considered the passing of the civilization he grew up in. This sensibility is most pointed in the works that made his reputation, starting in the early 1980s with “The Dining Room.” The leading characters in these plays were members of an upper middle class of Anglo-Saxon descent and dwindling affluence and influence. Mr. Gurney regarded such folk, his spiritual and genetic kin, with a critical fondness that was too cleareyed to be nostalgic. Some reviewers still felt that Mr. Gurney was terminally limited by the gentility that shaped his characters. But as he grew older, he increasingly chafed against such perceptions. He began to experiment with new subject matter — retelling the story of Shakespeare’s Shylock in “Overtime” (1996), probing the Middle East conflict in “O Jerusalem” (2003) and crossing the ocean to set his diffident alter ego to roam (and get lost) in Japan in his poignant, autobiographical “Far East” (1999). Unlike many of his social stratum, Mr. Gurney’s political sympathies skewed left, and he was enraged by what he saw as the failings of the George W. Bush administration in the aftermath of the Sept. 11 attacks. At the experimental Flea Theater in downtown Manhattan, overseen by his friend Jim Simpson, Mr. Gurney found an unlikely forum for expressing his grievances. Writing in his 70s and 80s, he produced for the Flea a series of vigorous and fanciful satires about the state of his nation, which were written and produced quickly enough to feel as topical as the headlines on the days of their performances. They included “Screen Play” (2005), a prescient variation on the film “Casablanca,” in which American freedom fighters are smuggled into Canada. My enduring favorite, though, is the wonderful “Mrs. Farnsworth” (2004), in which Sigourney Weaver played a socialite with a secret (it involved the sitting president) and John Lithgow her William F. Buckley-esque husband. Ms. Weaver’s character was ultimately too, well, well mannered to detonate the metaphorical bomb that might have brought down the Bush administration. Mr. Gurney, though, had by that time shed many of his own inhibitions as a playwright. And he waged his own small but determined battle for the theater as a tool of resistance and enlightenment. I can think of few artists who were reincarnated as angry young men in their old age as unexpectedly and vitally as Mr. Gurney was. And young is the right adjective. The last new work I saw by him, at the Flea last fall, was a double bill of short works that pondered the boundaries of classic theater (in the first) and gender (in the second) with an infectious excitement you associate with writers in their 20s. Its title was “Two Class Acts,” referring to subversive intellectual exploration, theatrical performance and honorable behavior under siege. Those who would pigeonhole its creator should remember that all the meanings of “class act” apply to Mr. Gurney. Doonesbury — Who’s minding the kids? Trump to announce changes in U.S.-Cuba policy. Guns recovered in Virginia shooting were purchased legally. Oregon is the first state to add a third gender to drivers license. Bat-Signal to shine over L.A. in memory of Adam West. EU and China rebuff Trump on Paris climate change pact. Final toll in Kabul bombing: 80 dead, 300 wounded. James Comey will testify in public next week. Ohio sues five drug companies over opiod crisis. Pennsylvania doctor arrested with guns near Trump hotel. A man accused of stealing guns in connection with a possible plan for an attack has been captured in Wisconsin following a 10-day manhunt, authorities said. More than 150 local, state and federal law enforcement officials had been searching for Jakubowski, whom authorities suspected of stealing at least 16 high-end firearms April 4 from a gun shop in Janesville, a town not far from Wisconsin’s southern border. Police said he had written a 161-page antigovernment and anti-religion manifesto, which he apparently mailed to President Trump at the White House. It prompted police to monitor local schools, churches and public leaders as a precaution. “All of this alerted us that we needed a quick and thorough investigation,” he said. Good work on the part of the local authorities. Meanwhile, the Trump administration is doing all it can to keep Syrian children from coming to the U.S. because, y’know, they too might knock over a gun store, right? Oh, by the way, notice that they don’t call the suspect a terrorist. Who ever heard of a terrorist named “Jakubowski”? Democrats plan to filibuster Neil Gorsuch. Israel holds U.S. Jewish teen over bomb threats to synagogues. Canadian school board halts travel to U.S. over travel ban. Senate votes to let ISPs sell your data without consent. Trump proposes to increase Pentagon budget by 10%. Strike targets al-Qaeda leader in Syria. Hundreds of Jewish graves vandalized. Kansas bar shooter appears in court. SpaceX plans first trip to the moon.